When our son Jehan was a toddler, we noticed that he was keen about absorbing, understanding and classifying information. He would pore over complex information sources like field guides and instruction manuals, asking us for the meanings of symbols and pictograms in his own toddler-like way. However, he was in a Montessori where these innate interests were not nurtured, and he started to become withdrawn and diffident. On meeting with the PRM in Vivero Sarjapur, and on seeing the ethos and vibe of the school, we instantly felt that this was the right place for Jehan. Over the last few months, he has gained a lot of confidence, and for the first time in months loves to sing, dance, and engage in activities like craft and building, along with his previous interests. Vivero teaches a wide range of activities and values, such as gardening, taking care of the environment, respecting community workers, and learning through field trips. Advika had the most splendid 3 years at Vivero! She has learnt so much and has grown up into a confident little girl! I am sure she will miss Vivero and all her lovely teachers so very much! It’s hard to say good bye to such a lovely school, filled with so much love and warmth! We would like to congratulate the members of Vivero International School for the wonderful and heart throbbing Annual day event. We were truly thrilled and amazed with the performances of lovely kids. It would never have been possible without the utmost dedication and out of box thinking of the staff. Thank you very much for making it such a memorable event. 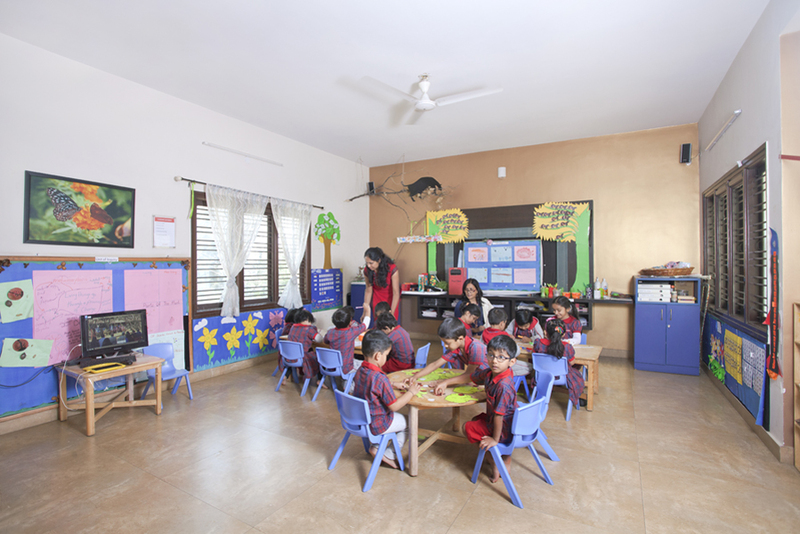 When I moved from Singapore back to India, I knew about Vivero and it was the school of choice given its proximity to my house and affiliation to Eton House, Singapore but I also came with the usual preschool apprehensions of an Indian parent. Given that my daughter had started school at a very early age, I wanted a school to advance her potentials beyond what she already knew. During my first meeting, the world of Reggio Emilia pedagogy was described and while I put my belief in it, the teachers at Vivero made sure my daughter had the right exposure beyond the curriculum. Today I see her as a smart, wise, inquisitive child with the ability to apply knowledge gained at school. Vivero has been beyond cramming and about applied and methodical learning. Vivero has also stood out as a safe and hygienic place; the two factors which make most parent so today paranoid about for their kids. One of the many examples is when the other day the Relationship Manager informed me about my daughter putting her hands outside the van window adding that she has explained her why not to do so. Washing hands before and after eating; prompt changing if in a mess, neat and clean rooms and play areas and the child care has opened my kids to healthy living while giving me peace of mind. While the curriculum and teaching methodology has been impressive, I have been most awed with Miraaya been instilled with respect, kindness, compassion and care for her little brother, her classmates, people, and the environment around her. Teachers are observant and coach the kids to correct themselves by figuring the right way. Not only have they been a guiding force to my children but the teachers have also guided me on how to be a better parent for my little kids and help in their behavioral growth. I would like to thank Rachna, Janhavi and the teachers for being so welcoming to our suggestions, receptive to changes, for parents’inclusiveness, for all the enriching programs and activities and for just leading from the front. 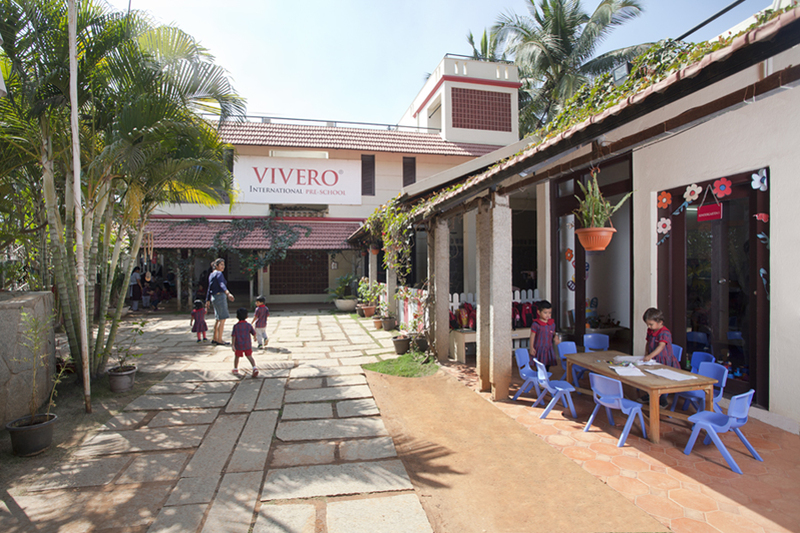 Vivero has changed our perception of a preschool. 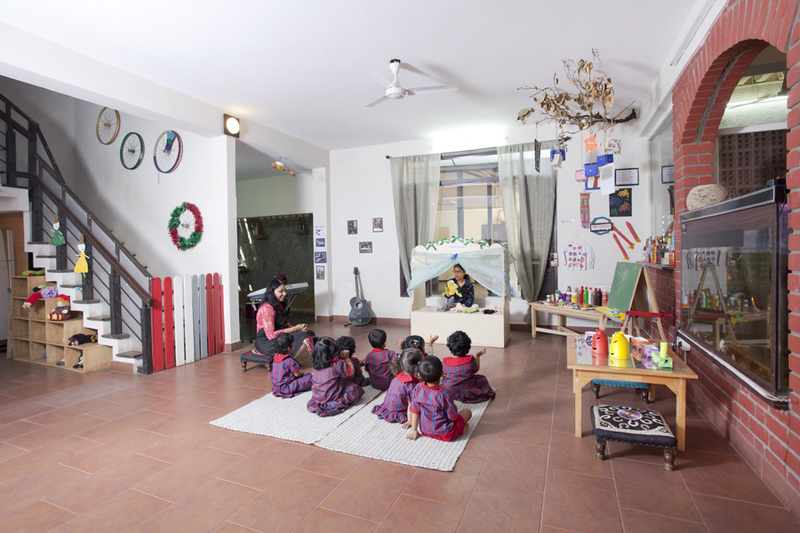 Vivero has been an enriching experience for my kids and for us and three months back I had no second thoughts to put my 18-month-old son Mairava in the school. 1) When we look back 9 months ago, we realize that it was definitely a right decision to have Riddhi at Vivero, Sarjapur. It is an utmost joyous feeling to see Riddhi learn and grow well over these many months - it is obvious that most of it came from Vivero. 2) A special thanks toRiddhi's class teachers- they have been supporting Riddhi a lot all this while who in turn does not stop praising them. The teachers have always been compassionate with all the kids even when some have been cranky in early days of settling down. 3) School's administrative staff has been trying to do the best for betterment of logistics, care for children, organizing meaningful events etc. It really means a lot to first time parents like us. 4) Vivero's constant effort to teach good things to children is clearly visible in the way Riddhi talks, carries herself with confidence, sings the rhymes, performs acts etc. If we would continue in Bangalore, we would certainly have her in Vivero for Nursery as well. A round of applause and congratulations to the Vivero Team. Thank you to the School Head, PRM, teachersand every supporting member of Vivero for giving us a memorable annual day. My son Surya joined nursery just one and a half month back to Vivero.I was worried like any other parent when we choose Vivero. It is our first pre-school experience.I can't believe the amount of growth my son has made at Vivero, he gained confidence and fine tuned his social skills .Every day he comes home with a great smile to share his fun and activities that he experiences at Vivero. One day,on the way home from school, he noticed few workers at a construction field . Immediately he asked me Mama, why are they not going to school like me and they are working in the hot sun.I was awestruck with his thought process.Everyday we experience many new and fun filled things with my little kiddo. We can see a lot of change in his thought process, socialisingand behaviourskills . On the annual day, when I went to pick my kiddo back stage, he camerunning to me and said "Mama , I did it . I was not afraid on stage and I didn’t cry at all. I danced and all my friend's parents also clapped for me." He was so happy. His grand-parents too truly enjoyed the annual day event when I told my dad that I wrote a testimonial to Vivero,he specifically told me to include their greetings too. His grand-parents came all the way from Hyderabad only to watch Surya on stage. My heartfelt thanks to the PRM and teachers for being so concerned and reassuring us always that he will be fine. Not the least but Thanks to the helping staff and security staff too. As soon as we enter Vivero, each day we are greeted by such friendly, engaging and nurturing educators.You people take the time to know each child and their families so that everyone is comfortable,the children and the parents!You provided a warm and loving, safe environment for my child as it is his first foray into the world beyond home. Undoubtedly, he is in loving hands that he trusts. Finally, I could say Vivero is a place where children are embraced,nurtured and supported along with the curriculum and the great staff which would allow children to excel both academically and personally. I am glad to be a part of the Vivero family. Looking forward to another year experience.Best wishes to the whole team. When at the end of the day I come to school to pick up my son, Nicolas, I often hear him asking me why I came so early. He doesn’t want to pick up his backpack, nor tell me about his day. Not hello mom, not how are you, but can I stay a little longer? Please? He loves showing me around, proudly showing me the work he had done, his special places, the walls where his art and pictures are hanging, where he had made his mark, where he belongs. We may think that a great school is what makes our child love school, but the truth is it is the teachers more than anything. Those teachers we sometimes just expect to love our children, flaws and all. Those teachers we just expect to make it work, to make everyone learn, and to do it with a smile on their face. They make the difference, they change the world, but most importantly they change our world. So, once again to the whole Vivero team, I tell you you matter, I tell you that you are making a difference, but I will never be able to tell you how much! You have made my son believe that he can, that he has a home away from home. You have not told him he needs to be perfect, nor that he will do everything right the first time, but you have made him feel that he can try, that he can think, that he can dream. Shelly, from one teacher to another; you are someone who makes me proud to be a teacher. From a parent to a teacher; no words. Thank you for loving my child, with all his craziness and all his ideas. I could never have made him love school like this. You did that and you taught your students how to love, appreciate, support and accept each other just the way they are! It means the world to my son to have such loving friends who laugh together with him at all his antiques and accept the way he is! And so, I say THANK YOU - to the teachers and staff at Vivero, to the community of parents I've met this year, and to all those of you who lifted us up, cried with us, hugged us, greeted us so warmly every morning, and were with us as Nicolas grew from a frustrated, confused child into the confident, happy, mischievous, curious child who has a voice and a community of people who are willing to listen to it. I hope you all have a place that welcomes your child and your family as much as Vivero did ours. And if you don't, keep looking. A community of acceptance, support, belief, and love is out there, just waiting to open its doors to you. Thank you so much for coordinating and organizing fantastic K1 performance/skit. In fact all the performances from kids were really amazing. We enjoyed thoroughly. I could see the hard work you all put up for this annual day and each year I see Vivero showcasing its uniqueness. Ameeta, I liked your anchoring as well. I could see your involvement in every performance from kids. Your enthusiasm and encouragement was really giving energy to kids. In fact all the staffs were so co-operative and accommodative. It’s really a mammoth task to arrange event of such magnitude. My hearty congratulations to you all. Our best wishes are with you and Vivero. Kudos to team Vivero, Sarjapura Branch, Bangalore for putting up such a fantastic annual day program. I would like to take this opportunity to thank each member of your team for everything that you do to make kids comfortable and provide them quality education in the process. Undoubtedly you all are contributing in a big way towards the nation building exercise by nurturing young minds. We are proud to be associated with you in such important years of my daughters life. My heartfelt gratitude to class teachers of nursery Nitasha, Seema and Sonjuna for the warmth and care that they provide to Vidita. Appreciate the efforts taken by them to conduct innovative activities in the class. Vidita cherishes her time spent with them. My sincere thanks to her day care teachers and each member of support staff. I must say we are at ease only because of the extra care that vidita gets by them. When we leave Vidita at day care we are rest assured that she is going enjoy her time there. Look forward to another year of truly rewarding experience with Vivero.Best Wishes! My heartfelt gratitude to class teachers of nursery Nitasha, Seema and Sanjana for the warmth and care that they provide to Vidita. Appreciate the efforts taken by them to conduct innovative activities in the class. Vidita cherishes her time spent with them. Look forward to another year of truly rewarding experience with Vivero. To all the teachers of Vivero!! I wanted to take a moment to share an honest feedback with all of you at Vivero. I had admitted Abhyudaya to Vivero almost a year and a half back. Initially I had inhibitions about putting my son in Vivero and was somehow not very satisfied in the early days; however I decided to continue due to proximity. Today I do not regret my decision. I have seen my son grow and learn so many things which may be as a working mother I wouldn't have been able to teach him so early. The reason I chose this day to convey my regards is particularly because as I came back from work, I saw my son tapping his feet and clapping his hands. It was an innocent and heart-warming performance on the rhyme:" If you are happy and you know it, clap your hands." I cannot express the joy on my face when I saw him dancing. He has learnt many more things and has become independent. And this has been possible because of the lovely things he learns with and from you. I want to sincerely thank you for the wonderful care and warmth.